This recipe for chewy almond sugar cookies makes a cookie so soft and delicious you’ll eat them all! Plus my secret tip for flawless cut-out cookies! I love to eat cookies, and these chewy almond sugar cookies are no exception! If I had to choose one type of dessert to live off of for the rest of my life it would be cookies. Mexican food for savory, and cookies for sweet. That sounds like a perfect life to me! The problem with cookies is that every single restaurant and store that you go to makes them – and most of the time, they’re more enjoyable than the homemade kind (“better than” is debatable, however). Whether they are softer, chewier, the edges are perfectly crisped, or they have the perfect amount of snap to them – it almost always seems like cookies from the store have a hand up on the ones you yourself can make. I’m going to let you in on a little secret. . . it’s because they use ingredients you can’t find at home! Whether it’s a preservative, an extract, or one of those ingredients you can’t pronounce. . .you just won’t be able to replicate it unless you’re willing to scour the internet for an ingredient that may be illegal to mail-order. 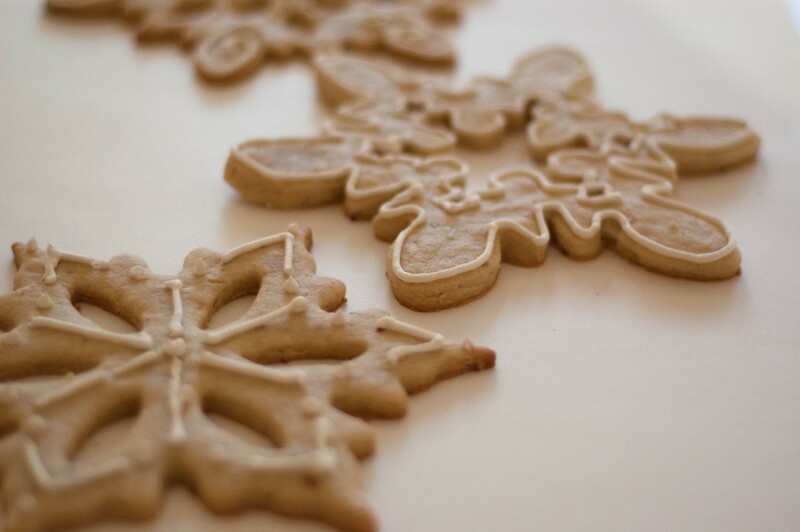 Depending on the recipe you are using, some cookie recipes will call for the use of parchment paper, or some will ask you to use a silicone baking mat, such as a silpat. Why would you choose one over the other? I personally find that there is only one real difference between the two: crispiness. You see, parchment paper is a thin paper that still allows for the conductivity of the pan to affect how the cookie bakes – so if you like a crisp cookie, it is easier to make that happen. However, if you like a chewier cookie, the silicone baking mat does a better job because the flexible non-stick material of the mat is thick enough that is creates a completely different cooking surface; allowing for even heating, despite how dark or light your pan is, which is ideal for today’s chewy almond sugar cookies. Cookies will continue to bake on the pan even after you have removed them from the oven. If your cookies are too close to done for your liking, removing the silicone mat from the pan will help cut the cooling time down and prevent your cookies from over-cooking! Double-Sided. There is a smooth side, which is great for pretty much anything, and there is also a textured side, which helps prevent against slipping. While this may not seem like a big deal, when you’re making delicate and intricate cutout cookies, the last thing you want is to pull them out of the oven and have them slide around an knock a leg off of Rudolph. Try explaining a 3-legged reindeer to a 2 year old without scarring them for life! Oven Safe. Each silicone mat is different depending on the brand that you purchase, but most of them are rated up to at least 450°F. Silpat brand is 480°F safe. Which means it’s useful for almost anything you plan to bake. Cooling Time. This is one of my favorites. Because of the silicone texture of the mat, within a minute of removing your pan from the oven, you can pick up and remove the mat from the pan to cut cooling time in half. There are handy biased-cut corners that make it easy to lift out of the pan and transfer to another surface without burning yourself (but always be careful when handling hot items, and keep any necessary first-aid treatment around just in case). Easy Clean-Up. One of the things I often hear from people is how they don’t like how dirty their sheet pans look. With a silicone mat, you are protecting the surface of your sheet pan as well as allowing for easy clean-up. The nonstick material is SO easy to clean – I mean, crazy easy. Most silicone mats are hand-wash only, but they are so easy to clean you won’t care! Storage. These mats roll up nice and compact for easy and quick storage. Just make sure you always roll them, never fold them, unless you want to do permanent damage. Hack: Protect the shape of your cut-out chewy almond sugar cookies by rolling out the dough on your silicone mat, cutting your cookies, and removing the excess dough so you don’t have to transfer your cookies. If you really want to rock today’s chewy almond sugar cookies, then make sure to brush up on your creaming baking method. If you’ve ever had questions like “How fluffy should my butter and sugar mixture be?”, then that post will help you out tons! You can also check out the different kinds of flour if you’re feeling particularly curious today. 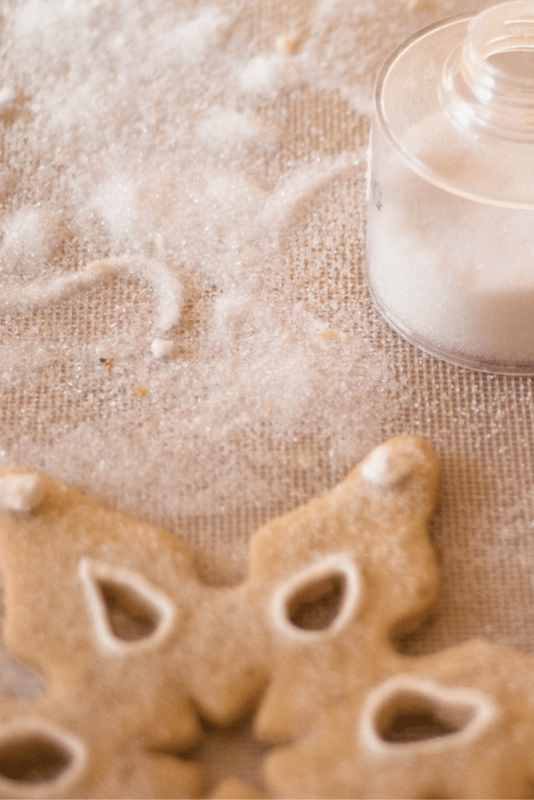 For the best flavor in your chewy almond sugar cookies, make sure to use pure almond extract, not imitation. 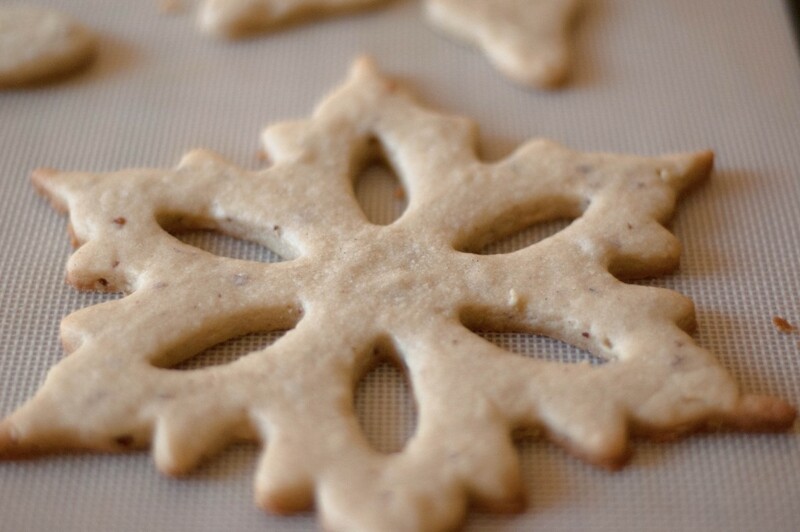 This will help ensure the you have the tastiest cookies at your cookie exchange! Get your free printable grocery list for this Chewy Almond Sugar Cookies recipe HERE. If you’ve never used one of our printable grocery lists before, all of the amounts are listed in easy-to-find grocery store amounts. If no amount is give (like with the flour), that means you can purchase the smallest (or largest, if you want) container available and will leftovers for another use later. 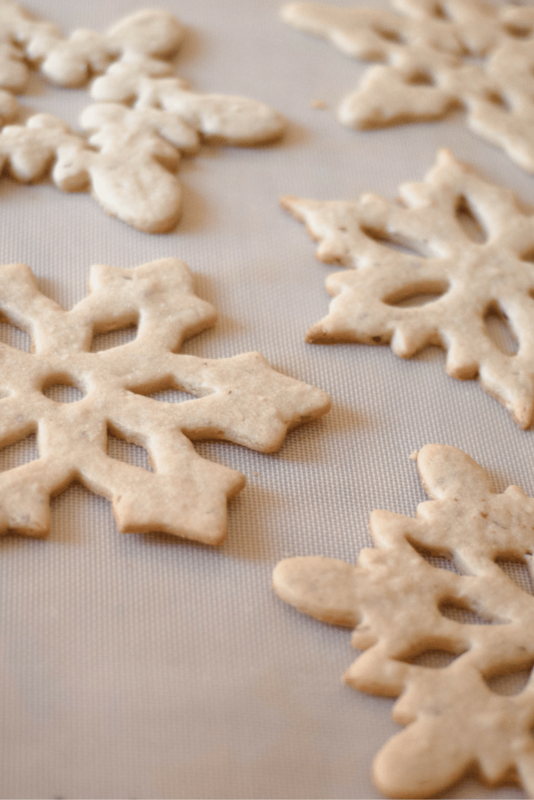 These chewy almond cut-out sugar cookies are the perfect cookie to leave out for Santa. The dough holds its shape perfectly and the flavor and texture of the almonds makes them extra fun! These cookies taste great as is, or decorated. Sift together the all-purpose flour, the salt, and baking powder. Mix in the smashed almonds and set aside. In the bowl of an electric mixer, cream together the butter and granulated sugar until fluffy. About 2 Minutes. Add in the vanilla and almond extracts. While the mixer is running, carefully add in the flour combination 1/2 cups at a time until the dough comes together and all of your dry ingredients are used. Chill for 30 Minutes. On a floured surface, roll out the dough until it is around 1/4" inch thick. 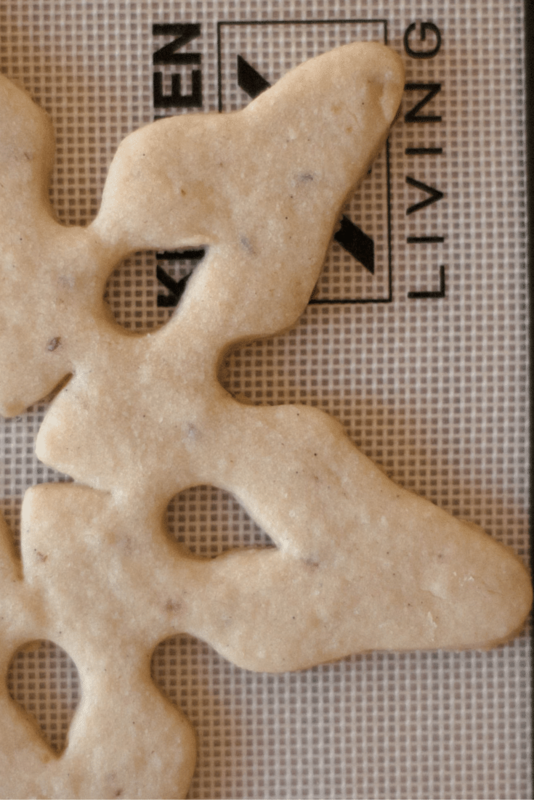 Cut into your desired shapes and transfer to an ungreased baking sheet. Bake for 10 Minutes or until the edges just start to brown. Cool on a wire rack and decorate if desired. Repeat as necessary. If your almond cut-out sugar cookies still look shiny when they come out of the oven, put them back in and cook for another minute or so. If you choose not to decorate the cookies, sprinkle them with granulated sugar as soon as they come out of the oven for fancier presentation. I just love a good cookie cut-out recipe! Thanks for sharing! Me too Carrie. I hope you try it! These cookies are so beautiful! I love that it’s almondy too! Kick up the ordinary sugar cookie! It’s so nice to step away from the ordinary isn’t it Debi? Especially during the holidays when you eat so many cookies! Oh do these look amazing! Looking at these pictures gets me excited for Christmas. Can’t wait to start biting into cookies like these! YES!!!! Chewy cookies are my weakness! Those are stunning! I just love the snow flake designs are perfect for Christmas! Thank you! The snowflakes are always so fun to decorate too! These cookies look wonderful! I love the snowflake shape! Thank you, Kathy! They’re just so fun and put me in the Holiday mood. I look forward to using them every year! What a GREAT post! Loved all the tips and tricks you added to this post, plus the recipe looks amazing! Thank you so much, Jenni! Those tips and tricks can go so far – especially when you’re making dozens of holiday cookies! You have done a Great Job. I Love Food and any time ready to enjoy various types of food flavours. Keep Posting More Soulful Delicious Recipes. Almond in sugar cookies? What a fantastic idea… yum! I’ve been looking for a really good sugar recipe that holds its shape well when baked, and it looks like I’ve found it. Thanks, Mackenzie! 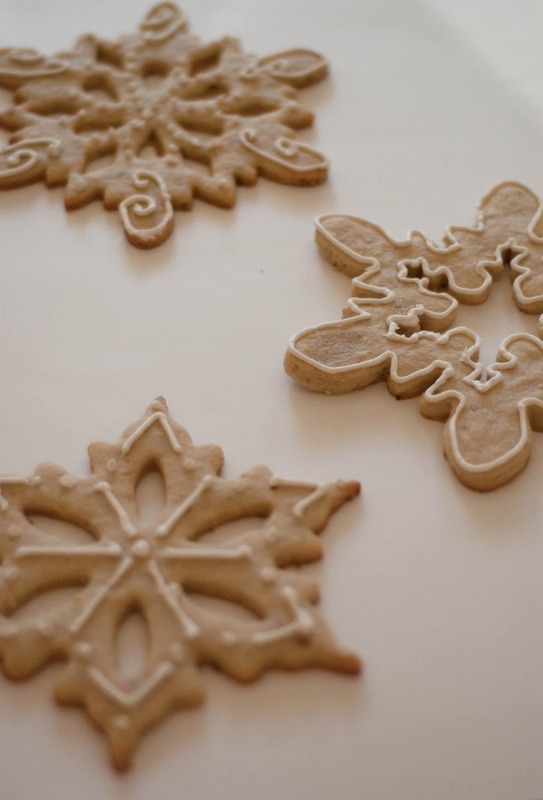 These snowflake cookies are beautiful and will be such a lovely addition to my gift trays. I love my silpat mats too. So great for both cleanup and even baking. I love that cookie cutter! It’s so fun and wintery! I hope your cookie making goes splendidly!